Now you can keep any room in your home warm and cozy on cold nights. Certified as a heating appliance, the 45-DVFS28N can be installed almost anywhere in your home and is suitable for continuous zone heating operation. This allows you to enjoy warmth where you need it most, saving you energy costs without compromising comfort. 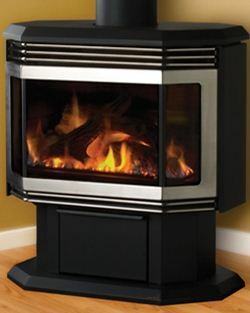 The 45-DVFS28N is made with the same quality workmanship as old fashion freestanding stoves, and is built to last. Backed by Archgard's limited lifetime warranty, the 45-DVFS28N is constructed mainly of 16 and 18 gauge aluminized steel, giving it a strong durable feel our customers expect.